NFKB p65 antibody LS-C18905 is an unconjugated rabbit polyclonal antibody to human NFKB p65 (RELA). Validated for ELISA, IF, IHC and WB. Cited in 3 publications. The NFkB p65 peptide corresponding to the NLS of the human protein conjugated to KLH using maleimide. A residue of cysteine was added to the amino terminal end to facilitate coupling. 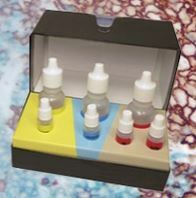 Suitable for immunohistochemistry, immunoblotting, ELISA and supershift assays. This product was assayed by immunoblot and found to be reactive against NFxB p65 NLS at a dilution of 1:2000 followed by reaction with Peroxidase conjugated Affinity Purified anti-Rabbit IgG [H&L] (Goat) catalog no. LS-C60884. Anti-NFxB NLS is suitable for the gel supershift assay and was found to be reactive against all p65 (Rel A) containing human NFxB complexes using 0.5 to 1.0 ul per assay. Anti-p65 NLS Antibody - Immunohistochemistry. Rabbit anti-p65 NLS was used at a 1:200 dilution to detect p65 in (A) control DU145 cells and (B) TNF stimulated DU145 cells. Although DU145 show relatively high basal levels of nuclear p65 staining, significant enhancement of nuclear staining is seen in panel B as evidence of translocation and availability of the NLS to be bound by the antibody. 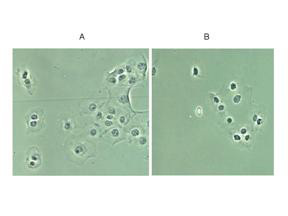 Cultured cells shown above were formalin-fixed. tissue staining (not shown) were formalin-fixed, paraffin embedded followed by citrate retrieval. Blocking and hybridization included 5% NGS. Anti-p65 NLS Antibody - Immunofluorescence Microscopy. 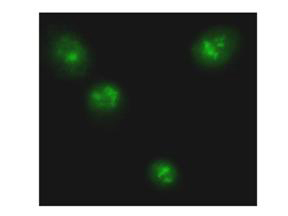 Rabbit anti-p65 NLS was used at a 1:200 dilution to detect p65 in TNF stimulated DU145 cells. Image shown is at a 1:400 magnification. Tissue was fixed and prepared as above.